Citation Styles -- APA, MLA, etc. 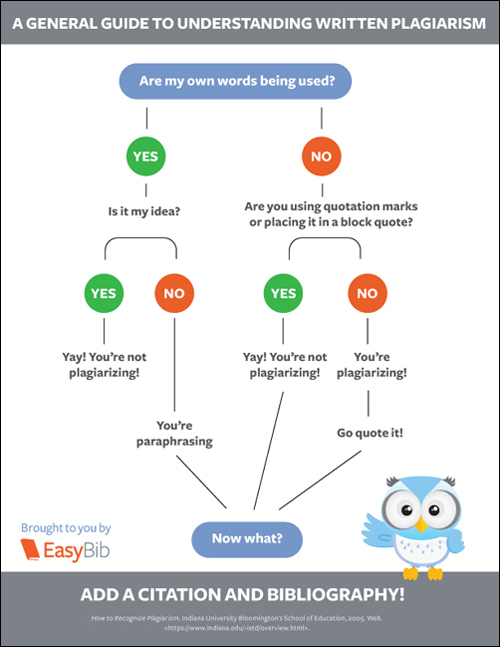 Plagiarism is intellectual theft. It means use of the intellectual creations of another without proper attribution. Plagiarism may take two main forms, which are clearly related: 1. To steal or pass off as one’s own the ideas or words, images, or other creative works of another and 2. To use a creative production without crediting the source, even if only minimal information is available to identify it for citation. Credit must be given for every direct quotation, for paraphrasing or summarizing a work (in whole, or in part, in one’s own words) and for information that is not common knowledge. From the MU Writing Center's "Writing Across the Curriculum" guide. From the OWL (Online Writing Lab) at Purdue. An animated tutorial from the Acadia University library. From Writing Tutorial Services at Indiana University.